.THE COMBINATION OF RECORD BREAKING HEAT IN THE TRIPLE DIGITS AND INCREASING HUMIDITY WILL ALLOW FOR DANGEROUS AFTERNOON AND EARLY EVENING HEAT INDICES THROUGH SUNDAY. AN UPGRADE TO AN EXCESSIVE HEAT WARNING IS POSSIBLE FOR SOME LOCATIONS. * HEAT INDEX READINGS...105 TO 110 DEGREES. LOCALLY HIGHER READINGS ARE POSSIBLE. * TIMING...EACH AFTERNOON AND EVENING BETWEEN NOON AND 7 PM. 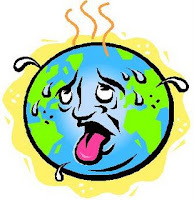 * IMPACTS...HEAT RELATED ILLNESS SUCH AS HEAT EXHAUSTION OR HEAT STROKE ARE A REAL THREAT. DEHYDRATION CAN OCCUR QUICKLY. THE EFFECTS OF THIS HEAT WAVE WILL BE CUMULATIVE GIVEN THAT IT IS GOING TO PERSIST FOR SEVERAL DAYS. REMEMBER...BEAT THE HEAT AND CHECK THE BACKSEAT. DO NOT LEAVE CHILDREN OR PETS UNATTENDED IN VEHICLES FOR ANY PERIOD OF TIME. ALSO REMEMBER TO CHECK ON THE ELDERLY AND THOSE WITHOUT INDOOR AIR CONDITIONING. A HEAT ADVISORY MEANS THAT A PERIOD OF HOT TEMPERATURES IS EXPECTED. TAKE EXTRA PRECAUTIONS IF YOU WORK OR SPEND TIME OUTSIDE. WHEN POSSIBLE RESCHEDULE STRENUOUS ACTIVITIES TO EARLY MORNING OR EVENING. KNOW THE SIGNS AND SYMPTOMS OF HEAT EXHAUSTION AND HEAT STROKE. WEAR LIGHT WEIGHT AND LOOSE FITTING CLOTHING WHEN POSSIBLE AND DRINK PLENTY OF WATER. TO REDUCE RISK DURING OUTDOOR WORK...THE OCCUPATIONAL SAFETY AND HEALTH ADMINISTRATION RECOMMENDS SCHEDULING FREQUENT REST BREAKS IN SHADED OR AIR CONDITIONED ENVIRONMENTS. ANYONE OVERCOME BY HEAT SHOULD BE MOVED TO A COOL AND SHADED LOCATION. HEAT STROKE IS AN EMERGENCY -- CALL 911. Heat is the #1 weather-related killer in the United States, resulting in hundreds of fatalities each year. In fact, on average, excessive heat claims more lives each year than floods, lightning, tornadoes and hurricanes combined! For heat safety tips from MWN, click here. For detailed heat safety information from the NWS, click here. Remember that a Code Orange air quality alert is also in effect for Shelby, Desoto, and Crittenden Counties. Another good reason to just stay indoors if at all possible. Memphis metro residents got an air quality wake-up call that seemed to come out of nowhere today. 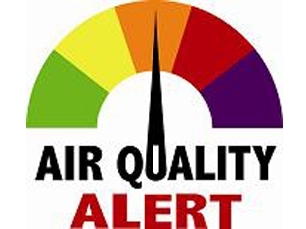 A Code Orange Air Quality Alert that has become the norm under hot and stagnant air conditions was raised to Code Red about 4:30pm as ozone levels climbed, then raised again to uncharted territory - a Code Purple alert - two hours later. Though the unprecedented Code Purple only lasted for about 90 minutes until the sun set, it still seemed to catch many metro residents by surprise. The overwhelming comment on MWN's Facebook post relaying the information was "wow!" Shelby County Health Department air pollution meteorologist Mike Goldstein indicated that this was the first ever Code Purple issued for the metro, which includes Shelby County, as well as Crittenden County in east AR and DeSoto County in northwest MS. "Our numbers are ...as high as I’ve seen in many years," Goldstein said. A Code Purple, which is the second highest of the color-coded air pollution levels, means that the general population, not just those who are in the "sensitive groups" category, could be affected. Ground-level ozone is different from upper-level ozone that people generally think of when referencing a hole in the ozone layer. Low-level ozone is formed when pollutants emitted by cars, power plants, industrial boilers, refineries, chemical plants, and other sources react chemically in the presence of sunlight. Ozone at ground level is a harmful air pollutant. At Code Purple levels, ozone can cause serious and lasting damage to the lungs. As long as hot high pressure remains over the Mid-South, MWN expects at least Code Orange alerts to be issued daily. If the right conditions come together, we could see more Code Red days, though hopefully not Code Purple. 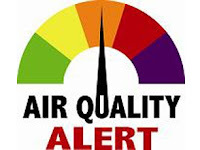 You can keep up with the current and forecast air quality levels, as well as tips to help reduce air pollution on the MWN Air Quality page or at AirNow.gov. A STRONG HIGH PRESSURE SYSTEM WILL BUILD OVER THE MID-SOUTH THROUGH THE END OF THIS WEEK, THROUGH THE WEEKEND, AND INTO MUCH OF NEXT WEEK. THIS WILL BRING A PROLONGED PERIOD OF VERY HOT TEMPERATURES WITH AN INCREASE IN HUMIDITY VALUES BY THE END OF THIS WEEKEND INTO THE FIRST PART OF NEXT WEEK. OF TIME OR FOR THOSE CONDUCTING STRENUOUS OUTDOOR WORK OR EXERCISE. REMEMBER, BEAT THE HEAT AND CHECK THE BACKSEAT. DO NOT LEAVE CHILDREN UNATTENDED IN VEHICLES FOR ANY PERIOD OF TIME IN THE HEAT. ALSO REMEMBER TO CHECK ON THE ELDERLY, THOSE WITHOUT INDOOR AIR CONDITIONING, AND OUTDOOR PETS. HEAT ADVISORIES WILL LIKELY BE ISSUED FOR THE END OF THIS WEEK OR DURING THE WEEKEND. PLEASE REVIEW AND ENACT HEAT SAFETY TIPS DURING THE NEXT SEVERAL DAYS AS TEMPERATURES AND HUMIDITY LEVELS RISE TO DANGEROUS LEVELS. In addition to the heat, ozone levels will be at high levels through much of this heat spell, likely prompting daily Code Orange air quality alerts. Precautions for poor air quality are similar to those for heat. To review heat safety tips from MemphisWeather.net, click here. What's up with these Code Orange ozone alerts? Thanks to hot conditions generated by stagnant high pressure over the region, the low-level ozone is forecast by the Shelby County Health Department Air Quality Improvement Branch to be high enough that a Code Orange Ozone Advisory has been issued for Wednesday. This is certainly not the first of these advisories to be issued this summer and it won't be the last. In fact, it's possible we could see them for the rest of the week based on the current forecast. Code Orange means that the air is "Unhealthy for Sensitive Groups," including those with respiratory problems under normal circumstances (asthma, lung disease, etc.) and active adults and children and the elderly. The Health Department urges everyone to reduce time spent outside and limit prolonged exertion, reduce trips and carpool and limit idling, and schedule outdoor activities in the morning and evening, avoiding the hottest part of the day. In addition, you can conserve energy but raising the thermostat slightly, turn off unused appliances and lights, and close the blinds or curtains so that less air conditioning is required to cool your home, all in an effort to reduce pollution. Why are we seemingly under more Code Orange alerts the past couple of years? It isn't entirely because the air is worse... the federal government recently (2008) changed the air quality standards, requiring stricter compliance and cleaner air. Therefore, code orange actually requires lower ozone levels than it used to - thus more alerts for the same ozone levels! As the typically hot summer season gets underway, the Mid-South continues to deal with a growing drought problem that unfortunately shows no sign of letting up anytime soon. Though parts of the area have received some helpful and significant rain in the last few weeks from passing storm events, rainfall deficits continue to generally increase, and the drought’s severity has begun to accelerate in response. 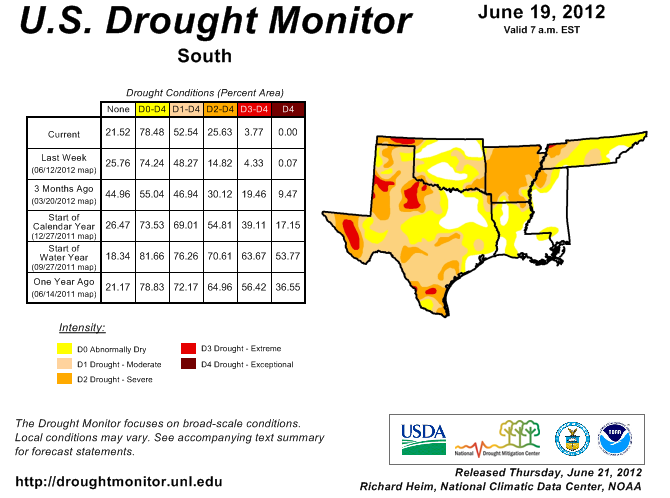 In the latest U.S. Drought Monitor dated June 19, the metro area now stands in “Moderate” to “Severe” drought conditions. 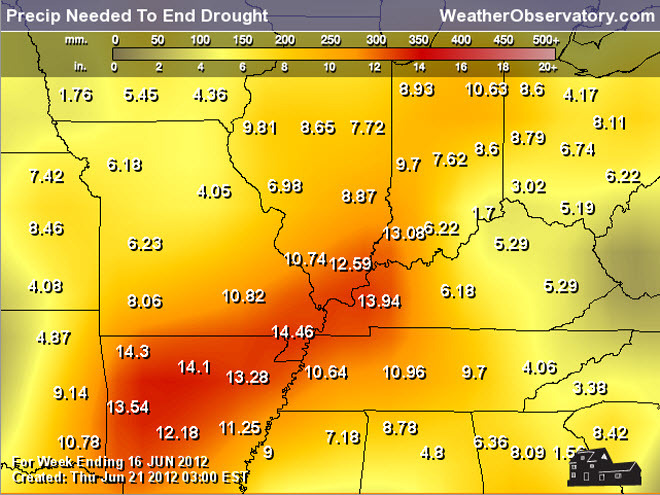 Locally, the worst drought conditions exist in the Crittenden County area as well as the northwest Mississippi Delta. Severe drought conditions have also grown to include nearly all of Arkansas as well as northwest Tennessee. Southwest TN, the biggest beneficiary to some of our recent rains, fares slightly better under the moderate drought. Still, this marks a deterioration of conditions there too. U.S. Drought Monitor as of June 19. Metro conditions range from "Moderate Drought" (tan) to "Severe Drought" (orange). The drought continues to worsen thanks to persistent high pressure that has held tight over much of the area since early in the year. This high pressure area has usually kept the active conveyor belt of weather, or the jet stream, far removed from the area. Thus, a long-term wet weather pattern has been very hard to come by. As of June 23, Memphis’s rainfall deficit has grown to over a foot, at 12.43”. With a yearly rainfall total of just 14.70” recorded at the airport that represents just 54% of the average. As the graphic below shows, much of the area needs anywhere from 9 to 13 inches of rain to end the ongoing drought, with even worse conditions to our north and west. As the situation worsens, so does the level of impacts to a variety of interests. Many area yards and plants are beginning to brown, requiring increasing amounts of daily watering. For those in agriculture, the lacking rainfall and drying soil moisture may soon begin to damage crops and limit harvest potential. Flow levels in area rivers/streams continue to drop with some tributaries potentially drying up. The Mississippi River at Memphis is currently at -2.55 feet, though still well short of the record low of -10.7 feet set in the historic drought of 1988. Fire danger is also increasing. While no burn bans or water conservation measures have been enacted to this point in the metro, much of AR is under a burn ban and such actions may occur locally as the summer continues if conditions do not improve. Unfortunately, it does not appear that the situation will improve soon. The short-term forecast (next 5-7 days) offers near zero rain chances as temperatures soar to the mid and even upper 90s. Long-term forecasts don’t offer much hope either with above normal temperatures and near to below normal precipitation over the next 1 to 3 months. As such, the Climate Prediction Center indicates our drought persisting or intensifying through the end of September. The seasonal drought outlook through September 30. Drought conditions are expected to persist or intensify. In these situations it often takes the remnants of a tropical system moving through the area to break the drought. While Tropical Storm Debby did develop yesterday in the central Gulf of Mexico, its track remains very uncertain due to a wide range of solutions offered by computer models. Chances are that we would receive little if any rain from this storm no matter it's track given the intensity and persistence of high pressure overhead. We will continue to monitor Debby’s progress and let you know if that changes. 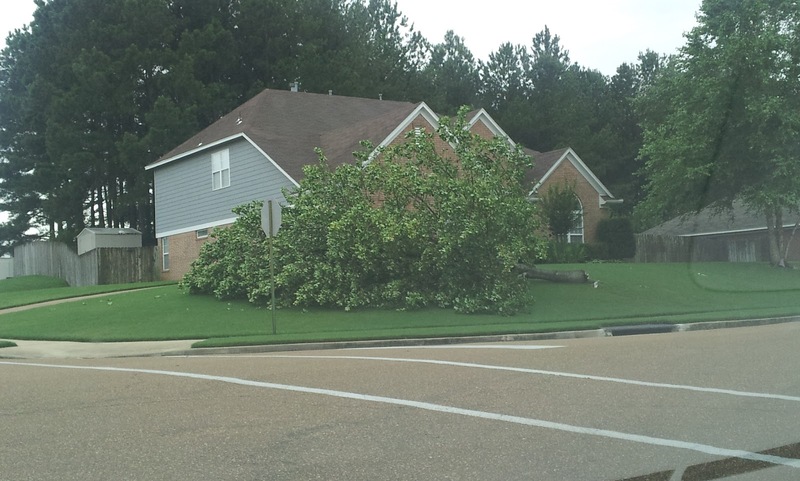 Stay with MemphisWeather.Net for up-to-date information on our worsening drought, the summer heat, Tropical Storm Debby, and all things weather affecting the Memphis area and the region as a whole! NOAA's Climate Prediction Center released their updated temperature probability outlooks today. Below are the outlooks for July 2012 and the July-August-September period. The tan colors indicate temperatures above normal are more likely than temperatures below normal. Light blue colors indicate temperatures below normal are more likely than temperatures above normal. To decipher, consider first that in a "normal" regime, there is a 33% chance of above, near, or below normal temperatures. Inside the 33% outlook area (light tan) there is a better than 33% chance of above normal temperatures and a subsequent reduction in the chance that temperatures will be below normal (the chance of "normal" temps remains fixed at 33%). In the case of a 50% above normal area (dark orange), there is a 50% chance of above normal temps, a 33% chance of normal temps, and a 17% chance of below normal temps. The primary drivers of these forecasts for above normal conditions are the return of ENSO neutral conditions (neither El Nino or La Nina) this summer, dry soil moisture conditions (which promotes heating), recent trends, and long-range climate models favoring above normal conditions. The Memphis metro is in the 33% area for July and 50% area for the July-September average. In other words, if this long-range forecast verifies, we can expect a long hot summer! For more information and the remainder of the outlook maps, including precipitation outlooks and outlooks for further into the future, visit the CPC website. Happy Father's Day to all of you dads out there! It's been said that being a father is easy, being a dad is something entirely different... I'm grateful and blessed to get to work every day at being a great DAD! The weather this week is going to cause everyone - dads and all - to want to leave the mower in the garage and find the nearest swimming pool! Though we've had a taste of summer already this year, this will be the first full week of summer-like conditions for 2012, just in time for the summer solstice, which occurs Wednesday, June 20, at 6:09pm CDT. The first full day of summer (on Thursday) also happens to coincide with the first day of 2012 that MWN is forecasting mid 90s for high temperatures! The summer solstice is the point in time when the Earth's axis is most inclined toward the sun, yielding the longest day of the year for the Northern Hemisphere, thus the beginning of our summer. It is also the day when the apparent position of the sun is the highest in the sky for those in the Northern Hemisphere. 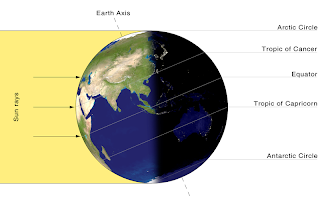 The graphic below shows the illumination of the Earth at the summer solstice. Notice that the areas around the Arctic circle get light all day as the Earth rotates, while those areas near the south pole are in darkness all day. The reason for this week's hot temperatures can be traced primarily to the mid and upper levels of the atmosphere, where a massive ridge of high pressure will reside over much of the eastern half of the U.S. with the main jet stream near the U.S./Canadian border. The graphic below shows the jet stream in pinks and reds well to the north and high pressure dominating the eastern U.S. on Tuesday evening. Jet stream-level picture of the atmosphere on Tuesday evening. Broad high pressure dominates the eastern half of the nation. The recent dry conditions won't help the heat either, as the moderate drought will mean the ground, and therefore the air directly above it, can heat even more quickly than if the ground were more moist - perhaps adding a couple of degrees to the high temperatures over what this weather pattern would typically produce given more "normal" rainfall leading up to now. MWN is expecting highs to be in the lower 90s for the first half of the week, then mid 90s for the end of the week and into the weekend. Rain chances are very isolated until at least next weekend and humidity values will likely mean our first 100-degree heat indices of the summer by next weekend as well! Heat and drought also tend to build on themselves, meaning once they begin, it takes more rain or a larger "push" of cold air to break the cycle. Hopefully it doesn't mean a long, dry, hot summer ahead! This heat wave will be felt throughout the eastern U.S. under the influence of the upper level ridge. Check out the nationwide high temperatures forecast for Wednesday below. High temperatures forecast for Wednesday by the NWS. Heat will dominate the eastern and southern U.S.
How about you? Do you prefer the heat and "dog days" of summer or are you a cool weather fan? A mesoscale convective system (MCS)-turned-derecho swept through the Memphis metropolitan region on Monday afternoon, June 11. Beginning as a cluster of storms in west-central Missouri, the system gained strength, feeding on very unstable air in it's path as it rounded an area of more stable air as it dove southeast into the Mid-South and then all the way to the Gulf Coast. A derecho is a type of MCS that produces widespread severe and damaging straight-line wind. They aren't as common as other types of MCS's and tend to feed on the warm and unstable airmasses produced during the summer months. A derecho, by definition, must produce a swath of severe wind (58 mph or greater wind gusts) and damage over a path of at least 240 miles. These systems last for hours and must have produced continuous damage with no breaks for more than a couple of hours. Typically they appear as a large bow-shaped band of showers and storms. The most cited example locally of a derecho is the "Mid-South Summer Storm of 2003," more commonly referred to simply as "Hurricane Elvis" which occurred during the morning rush hour on July 22, 2003. As seen in the radar animation of this particular storm system below, the derecho began over Missouri in the late morning hours. It dropped southeast through the Mid-South around mid-afternoon, then elongated and continued unabated through the Deep South, affecting Mississippi and Alabama before falling apart as it moved over the Gulf of Mexico. The total distance traveled was over 600 miles! As you can see, additional storms fired along the outflow of the derecho over southern Arkansas and eastern Oklahoma and Texas, which then became an MCS of it's own as it dove south over Louisiana in the wake of the derecho. 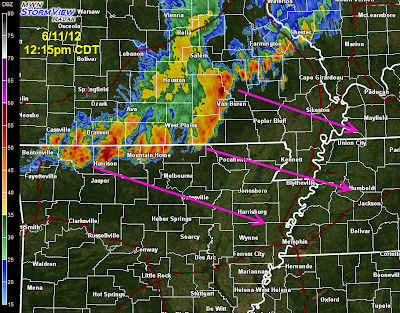 Radar animation of the long-lived derecho of 6/11/12. Courtesy UA-Huntsville. The impact of the derecho is clearly shown below in the graphic of severe wind reports from Monday and Monday night. Over 300 reports of damage or measured wind of 58 mph or greater were recorded, though some were part of the additional MCS that formed over Louisiana and Texas or separate storms along the Atlantic coast. Severe wind reports (308) from 7am Monday through 7am Tuesday as received by SPC. Locally, there were many reports of trees and power lines down, small outbuildings damaged or destroyed, and thousands without power in the storm's wake. MLGW ended up with nearly 15,000 customers without power by Monday evening, though all but a couple of thousand had been restored by Tuesday morning. Though not producing twisting tornadic wind, wind speeds can rival weak tornadoes in these storms. Thus, it is very important that precautions be taken during Severe Thunderstorm Warnings, at least staying indoors, away from windows, and out of harm's way. The 60-80 mph wind that frequently accompany derechos can also topple, or severely damage, mobile homes. If you live in one of these structures and have knowledge of an impending storm such as this one, it is always best to leave for sturdier shelter. For additional severe weather safety tips, visit the MWN Storm Center. What was your experience from this derecho? Did you lose power and if so, for how long? 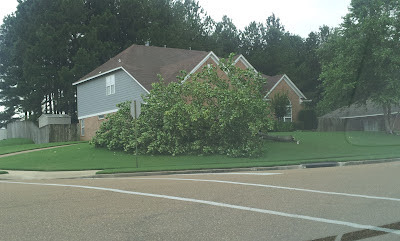 Did you lose any trees or have other damage? 2:00pm Update: A Severe Thunderstorm Watch has been issued for the entire metro until 9pm. The mentioned MCS (area of storms) has moved into northeast AR and will move into northern Tipton Co by 3pm and into the city of Memphis by 4pm, continuing through northwest MS, including DeSoto Co, by 5pm. Damaging wind of 60 mph+ and hail are the main severe weather threats. Heavy rain will also affect the afternoon commute with areas of standing water likely. Plan additional time during your drive home this afternoon and exercise caution on area roadways. At 11:30am, the Storm Prediction Center expanded the Slight Risk zone to encompass all of west TN and north MS, adding to the previous area that included all of AR. This places the entire metro area in the middle of a chance of severe weather. The reason for the expansion has to do with the formation of an MCS (mesoscale convective system) in southern MO that is propagating east-southeast into an unstable atmosphere over the Mid-South. If it holds together, it could bring a squall line with damaging wind (or a #memstorm as it's come to be known on Twitter). 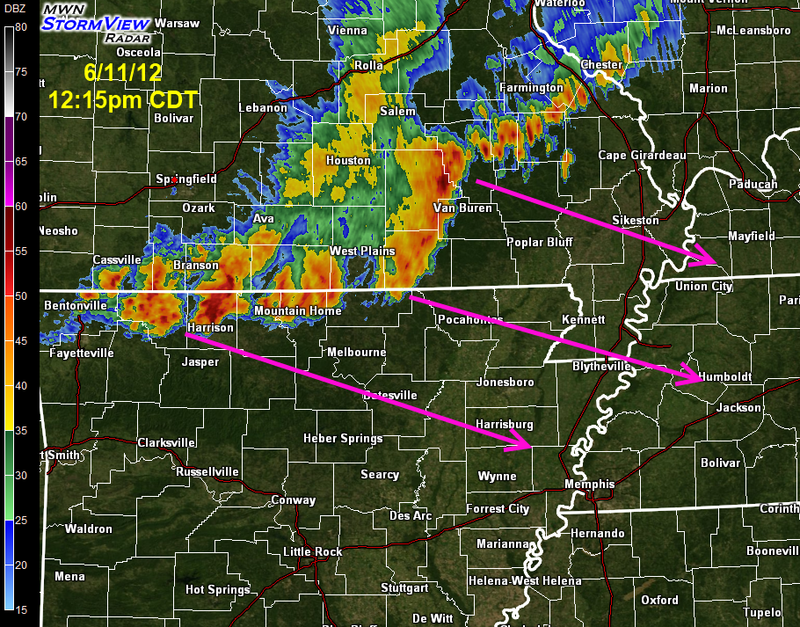 Timing for this line initially appears to be late afternoon, possibly during the afternoon rush hour. As we know, MCS's typically bring straight-line wind of 50-60+ mph, torrential rain that can produce localized flash flooding, and even some hail to a large area, which could include the entire metro area. Any wind damage could cause power outages in this type of storm as well. The chance of severe (58 mph or greater) wind with this slight risk of 30%, which is fairly significant. Wind and hail probabilities for today (chance of 58+ mph wind and 1"+ hail within 25 miles of any location). Though we are not certain that this storm system will make it all the way to the metro, the likelihood is increasing. In fact, with a cold front approaching the region, computer models are beginning to hint at another one of these storm systems forming over the AR Ozarks late this afternoon and moving southeast behind this system. Chances are this one would miss the metro to our south, but we'll need to be prepared for the possibility of more storms during the early overnight hours. MemphisWeather.net will be monitoring the developing weather scenario throughout the day and will be nowcasting any strong to severe storms as they happen on our social media channels listed below. Now is also a great time to pick up the MemphisWeather.net mobile app for Android or iPhone and activate StormWatch+, which will alert you via push notification if your location of interest is placed under a watch or warning. Get it at the link below! The Mid-South has been treated to a nice break from the heat much of this week, with temperatures in the 80s and low humidity, not like typical early June weather in this part of the country! Unfortunately, as you may expect, this nice weather is not made to last. A pattern change taking place over the weekend will not only bring the humidity levels back up, but our rain chances will be increasing as well. The pattern change is due to an area of low pressure, currently just off the northeast TX coast. As it moves slowly northeast into the lower Mississippi Valley this weekend, moisture will surge back into the Mid-South on southerly winds. Some good news – it does appear at least today will be in decent shape rain-wise. The humidity increase will be felt, and that may trigger a few thunderstorms by afternoon, but most metro residents should stay dry as the greatest rain will be concentrated towards central Mississippi closer to the low pressure. However, Sunday does not look to hold the same amount of hope. 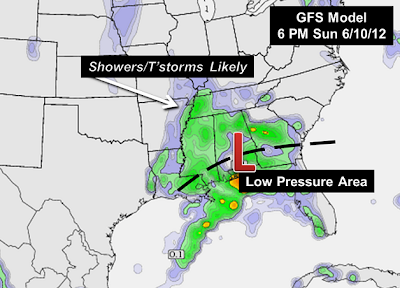 As the low moves closer, tropical moisture gets drawn farther into the area and will make showers and t’storms much more likely to impact the metro throughout the day on Sunday. While this will not be a classic severe weather maker, heavy downpours, lightning, and perhaps gusty winds could disrupt outdoor activities. Any slow-moving storm could result in localized flash flooding, even with much of the Mid-South still needing more rain to put a dent in our recent drought. So while the FedEx St. Jude Classic got a couple of great weather days to start the tournament, today will be more humid and breezy and, if the current forecast holds, tourney officials need to be prepared for some golf on Monday! There is some model disagreement on how fast this first system exits the area, but it looks as if it should push east enough of us to give the region a bit of a break on Monday, though a few additional storms popping up in the afternoon cannot be ruled out. The break is short-lived, as a cold front on the approach from the northwest moves in Monday night into Tuesday. This will result in another round of likely showers and storms that have a slightly better chance of being severe than any this weekend. By Tuesday night, the front looks to be just south of the area, which will mark the beginning of a drier pattern for a couple of days. That said, it won’t be much of a “cold” front, as high temperatures change little behind it. In fact, with less cloud cover, it's likely temperatures could be a little warmer towards the middle of the week than the beginning. MemphisWeather.Net will keep you updated on the upcoming wet weather, including nowcasting on our social media feeds (links below) for any thunderstorms that might impact the metro area. So what weekend plans do you have, and will they have to be changed if rain falls? It was a rare event - the Venus transit that occurred during the evening hours on June 4, 2012 - something none of you reading this will ever see again in your lifetime. If you missed it, NASA gives you a second chance. If you watched it, I can assure you that you didn't see it like this! The trend of very warm weather, which began this past winter, continued through the spring as once again another month went into the "Top 10 warmest" on record. The average temperature for May 2012 at Memphis Int'l Airport ranked #4 at 76.3 degrees. There were four daily temperature records tied or broken during the month, including record highs on the 2nd (90 - tie) and 4th (91) and record warm minimums on the 2nd (70 - tie) and 5th (73). Precipitation was also well below normal with a total of 3.17" recorded for the month - 85% of that amount fell on just 2 days! The metro is now classified as being in a moderate drought, which is a far cry from the past two years when record spring flooding was occurring during the month of May! In fact, on May 10, 2012, the Mississippi River at Memphis was 34 feet lower than one year ago on that date. The average temperature for the month of May was 76.3 degrees, 4.6 degrees above normal. The average high temperature was 86.4 degrees and the average low was 66.1. The coolest temperature of the month was 55 degrees on the 10th, while the highest temperature was 95 degrees reached on the 28th and 29th. There were 13 days in which the high reached 90 degrees or higher and only 6 days in which the average daily temperature was below normal (and all were within 3 degrees of average). Precipitation for the month totaled 3.17", which was 2.08" below average. As mentioned above, 85% of the rainfall for the month fell on 2 calendar days (1.78" on the 31st and 0.90" on the 7th). There were only 7 calendar days with measurable rainfall. The peak wind gust was 29 mph (from the south) on the 24th with an average wind speed for the month of 6.8 mph. Click here for a daily statistical recap for Memphis International Airport. Data from Cirrus Weather Solutions in north Bartlett is incomplete for May as the weather station was taken down for maintenance on the evening of the 21st through the end of the month. The average May temperature at Cirrus Weather Solutions through the 21st was 73.8 degrees with a maximum of 96.8 degrees on the 6th and a minimum of 49.8 degrees on the 10th. May precipitation taken from a manual gauge used for the CoCoRaHS program measured 8.86" - more than 5.5" greater than Memphis International due to the passage of very heavy training storms on the 6th/7th and 31st. 94% of the monthly rain was recorded on just 2 days. The measured peak wind gust through the 21st was 26 mph on the 2nd, though a severe storm on the 31st produced an estimated 50 mph wind. Average relative humidity was 67%. through the 21st. Click here for a daily recap on MemphisWeather.net. For the month of May, the average temperature error in all MWN temperature forecasts was 1.75 degrees, besting all available computer model data. Nearly 80% of the MWN temperature forecasts for the month were within 2 degrees of the actual temperature. MWN's forecasts extend out five periods (or 2.5 days). For dewpoint accuracy, the MWN forecast averaged 2.34 degrees of error and fell within 2 degrees of the actual dewpoint nearly two-thirds of the time. Historical accuracy statistics can be found here. A significant weather pattern shift has taken place across the eastern U.S. as a large upper level low pressure area has set up over southeastern Canada. Initially, this was evident as a very nice cool down the past couple of days as surface high pressure built in behind a strong cold front. Now, "northwest flow" has set up over the area, which means our mid-level wind (the level that typically steers storm systems) is out of the northwest between high pressure to the west and the low to the northeast (see graphic below). Mid-level (~18,000 feet) setup at mid-day on Sunday. 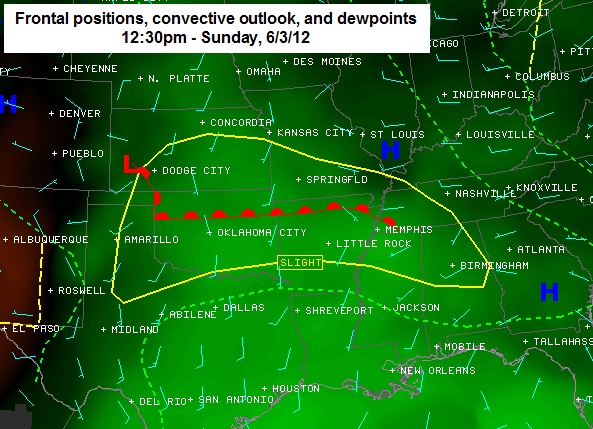 The Mid-South is on the periphery of a classic northwest flow regime. Typically, summertime northwest flow means somewhat unpredictable storm systems that tend to form during the overnight hours and move along frontal boundaries that are draped from the plains into the southeast. These storm systems are often referred to as "mesoscale convective systems" (MCS's) and the current setup favors just that type of scenario. The areas affected by these storm systems vary, but the threats posed generally are damaging straight-line wind and hail. MCS's in a northwest flow typically develop from clusters of storms that fire after dark as low-level (but above the surface) wind picks up after dark, then organize and follow the mid-level northwest flow downstream. Many times the storms begin to weaken and dissipate during the mid-morning hours, but occasionally they will continue through the next day. More often, as the storms dissipate during the morning hours, an outflow boundary from the storms will linger, allowing for the development of additional storms during afternoon heating. Sunday mid-day surface setup with a warm front just north of the metro, ample low-level moisture (green shading indicating high dewpoints) and a resultant Slight Risk for the Plains into the Mid-South. 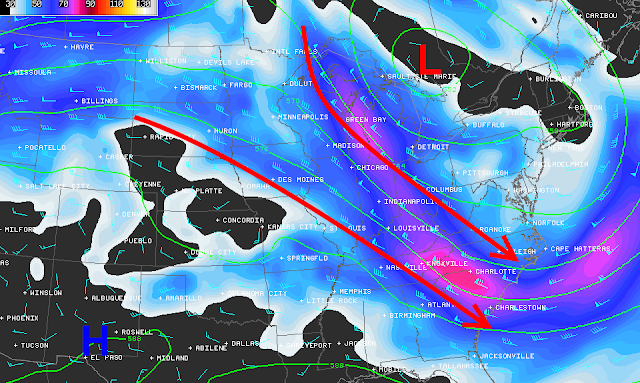 All this talk about northwest flow and MCS activity leads us to the forecast for the next couple of days. A warm front has moved over the metro, providing southerly flow and warm, very humid air to the region - a far cry from the past couple of days. This morning's scattered storms were the result of the warm front lifting north. Scattered storms are likely to fire late this afternoon into the evening in the humid airmass near and behind the front. These should end shortly after sundown. However, the first mid-level impulse in the northwest flow will provide for the formation of storms after dark not too far to our northwest, likely in northern AR. As the storms follow the flow in the first graphic above and the warm front, they will likely affect the metro area overnight. A Slight Risk of severe weather has been identified by the Storm Prediction Center as indicated in the graphic above. The primary risk with any storms today and tonight will be large hail and damaging wind, though storms that cross the warm front this afternoon could have enough low-level wind shear to spin up a brief tornado. 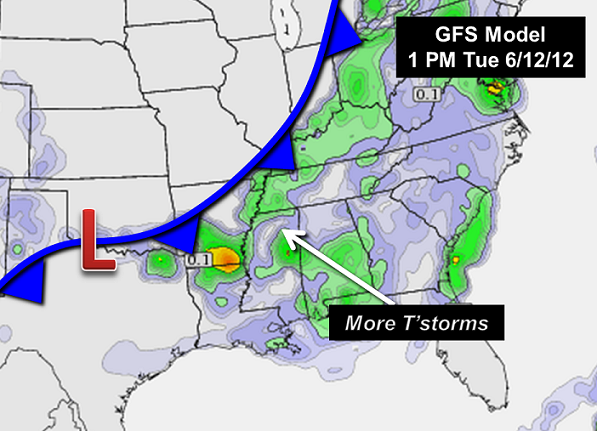 The graphic below indicates the NAM model's interpretation of where storms might be early Monday morning (between 4-7am). As indicated above, northwest flow events are very difficult to forecast precisely. After tonight's likely storms scenario, there will be additional chances for storms Monday afternoon and evening on any outflow boundaries produced by tonight's storms. However, it appears that, beginning Tuesday, the warm front may be pushed back to our south and become stationary southwest of the metro. If this is the case, further northwest flow storms would likely remain to our south for the mid-week and later period. MWN will be monitoring the situation carefully and provide nowcasting of any adverse weather on our social media channels (Facebook and Twitter links below). The best way to stay on top of the latest developments is via our MWN mobile app for Android and iPhone, which you can download at the link below. Be sure to upgrade to include StormWatch+ so that severe weather won't catch you off guard anytime of the day or night.